The Department of Theatre Arts regularly hosts master classes with artists, actors, producers, casting directors, designers, and directors from around the world. It was the Department of Theatre Arts version of Inside the Actor’s Studiostarring Angela Lansbury. The award-winning stage, film and television actress participated in a Q&A with University of Miami Theater students at the Jerry Herman Ring Theatre. Lansbury also received an honorary PhD from the College of Arts & Science. Aisha Hinds (True Blood, Assault on Precinct 13, The Shield, Medium, CSI:NY, NYPD Blue, Invasion, etc.) 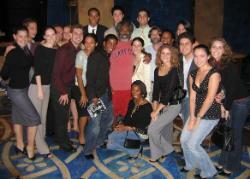 and BFA Acting 1998 visited the Senior class recently. She told the class of her great journey over the past ten years in the profession. Grammy winning singer - song writer John Mayer talked with Department of Theatre Arts students at the Jerry Herman Ring Theatre about his work and his music. The session was recorded for broadcast on MTV U. Several music theatre students were selected to attend his concert as his guests. 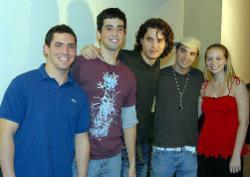 The lucky students met with John Mayer backstage prior to his concert, Winter Tour '07, at the University of Miami. Their evening at the concert and the accompanying events were taped for MTV U. 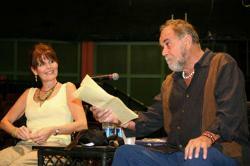 Husband and wife actors Lucie Arnaz and Laurence Luckinbill held a discussion with University of Miami theatre students at The Jerry Herman Ring Theatre and Alvin Sherman Family Stage. The couple discussed how to make a life in the theatre. Their daughter, Kate Luckinbill, is a 2007 graduate of the B.F.A. in Performance program of UM’s Department of Theatre Arts. André DeShields visits with students from the University of Miami's Department of Theatre Arts following his performance of King Lear with the Classical Theatre of Harlem. Michael McElroy directs UM students in the musical Violet. Michael recieved an Obie nomination for his performance in the original production and was nominated for a Tony for his performance as Jim in Deaf West's Big River.